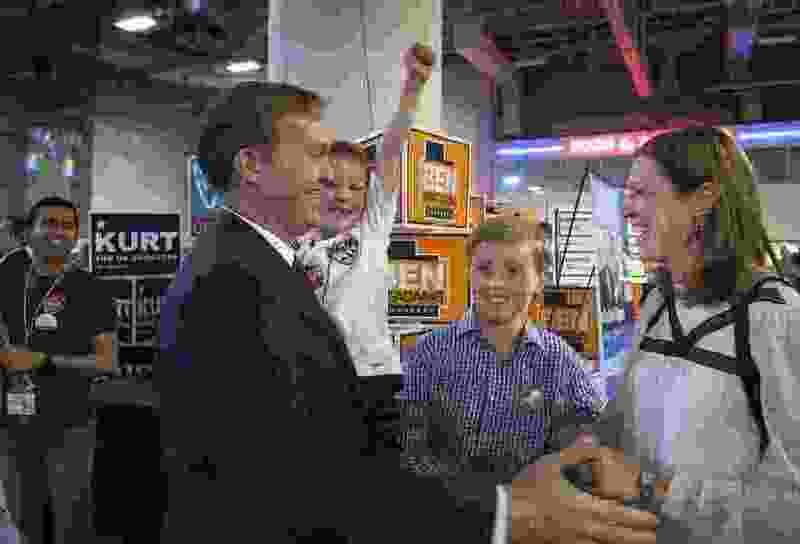 (Scott Sommerdorf | Tribune file photo) Ben McAdams and his family celebrate just after it was announced that he had won his race at the Utah Democratic Convention, Saturday, April 28, 2018. McAdams' son Isaac McAdams raises his fist in victory as James and Julie McAdams react. Democrat Ben McAdams, running for Utah’s 4th Congressional District, says he won’t back Nancy Pelosi for speaker if he and House Democrats prevail in November. But that’s not stopping GOP incumbent Rep. Mia Love from continuing to link him to the current minority leader. “It’s time for new leadership,” McAdams said Thursday. McAdams, Salt Lake County’s mayor, is among at least 10 House Democrats, including eight in the party’s “red-to-blue” push to take House seats from Republican incumbents, who say they’d vote thumbs-down on returning the California congresswoman to the speakership if the party wins back control of the House in November. He doesn’t have a preferred candidate yet, he added. Regardless of how McAdams might feel about Pelosi, a vote for him potentially gives her back the speaker’s gavel, the Love campaign said Thursday. McAdams says his position on Pelosi isn’t new, though it apparently hasn’t surfaced before in local media coverage. He said he decided on it after thinking through his candidacy. He isn’t getting financial help from the party’s House Majority political action committee, which is aligned with Pelosi. He said he told delegates at the state party convention last weekend, where he won the nomination, that he wouldn’t support her. Love, speaking at state and county GOP conventions last month, tied McAdams to Pelosi, and Hillary Clinton to boot, in her remarks to delegates. Her campaign manager, Dave Hansen, doubled down on the Pelosi tie-in Thursday: If Democrats take the House, she becomes speaker, hands down, he said. State Republicans are making the same point to stir up the party faithful. A survey emailed to Republican voters Thursday says voting for Love and other Republicans will block a Democratic House takeover and a likely Pelosi speakership.